Here’s a tasty recipe, created by a White House chef, to take to work for a heart-healthy lunch on the go. Experiment with other ingredients too — there are dozens of recipes for salads in a jar, which I often bring to the office for my midday meal. Makes 4 servings, to be packed in individual 1-quart Mason jars with lids. In a small bowl, whisk together lemon juice, zest, garlic, shallots, honey, and vinegar. Add olive oil slowly and season with salt and pepper. Pour into the bottom of the four Mason jars equally. For the salad, put one-fourth of the kale strips in each jar on top of the dressing. Divide the shredded cabbage equally for the next layer, followed by the carrots and fennel. 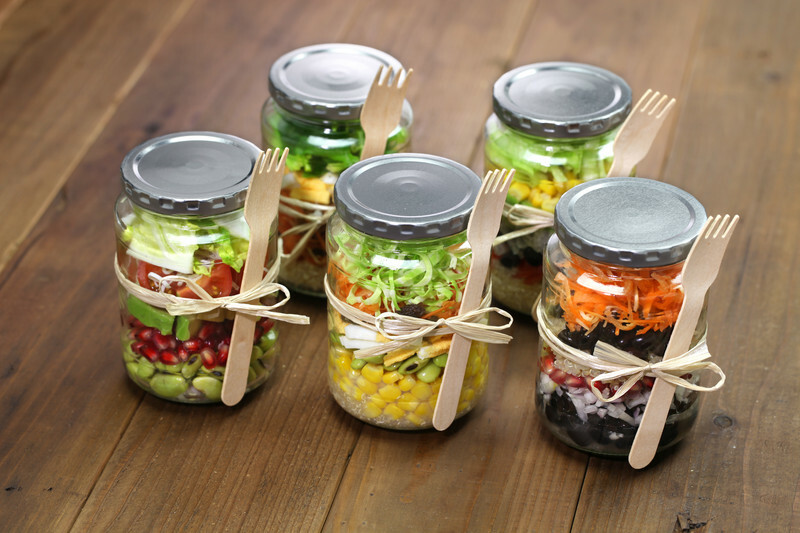 Top each salad jar with pumpkin seeds, cranberries, Parmesan cheese, and Serrano peppers. Close the lids tightly and refrigerate until use. The garbanzo bean croutons can be packed separately to maintain their texture. To prepare, preheat oven to 400°F. Spread the garbanzo beans on a cookie sheet. Roast until dry and crispy, about an hour. Toss in the spice and store in a covered container. When ready to eat the salad, shake the jar and place contents in a salad bowl. Top with crunchy garbanzo croutons and enjoy! Adapted from the letsmove.gov website.